Rolling rez arts is a new state-of-the-art mobile arts space. Rolling Rez Arts is a state-of-the-art mobile arts space, business training center, and mobile bank on the Pine Ridge Indian Reservation. In 2016, Rolling Rez Arts began delivering art, business, retail and banking services that were previously inaccessible to many of the artists and culture bearers who live and work on the Pine Ridge Reservation. The arts space on wheels was years in the making, and is the result of a group of people—from First Peoples Fund, Artspace, Lakota Funds, and Lakota Federal Credit Union staff to nonprofit partners to foundations supporters—coming together to infuse new energy into the creative economy. Learn more about Rolling Rez Arts and meet some of the artists and culture bearers who lead it. Cinematography and editing by FPF staff Bryan Parker (White Mountain Apache, Muscogee Creek, Mississippi Choctaw) and Angel Two Bulls (Oglala Lakota). The concept of Rolling Rez Arts came in response to a market study conducted by First Peoples Fund, Artspace, Colorado State University, Leveraging Investments in Creativity (LINC) and Northwest Area Foundation. The study explored the challenges and successes experienced by Lakota artists on Pine Ridge. It found that more than half of Native households on Pine Ridge are engaged in home-based businesses, and 79 percent of those businesses are in the arts. It also found that 61 percent of emerging artists have incomes of less than $10,000, but through participation in workshops and trainings—like what will be offer through the mobile art unit—that number increases dramatically. Rolling Rez Arts criss-crosses the Pine Ridge Reservation with a variety of classes, trainings, and banking services. Check out the calendar below for an opportunity to participate. Rolling Rez Arts was funded through grants from ArtPlace America, The Bush Foundation, Northwest Area Foundation, and USDA Rural Development, all of whom have partnered with First Peoples Fund in the planning, community outreach, and research that makes this innovative mobile unit a reality. Additional funding was provided to Artspace by The Ford Foundation. 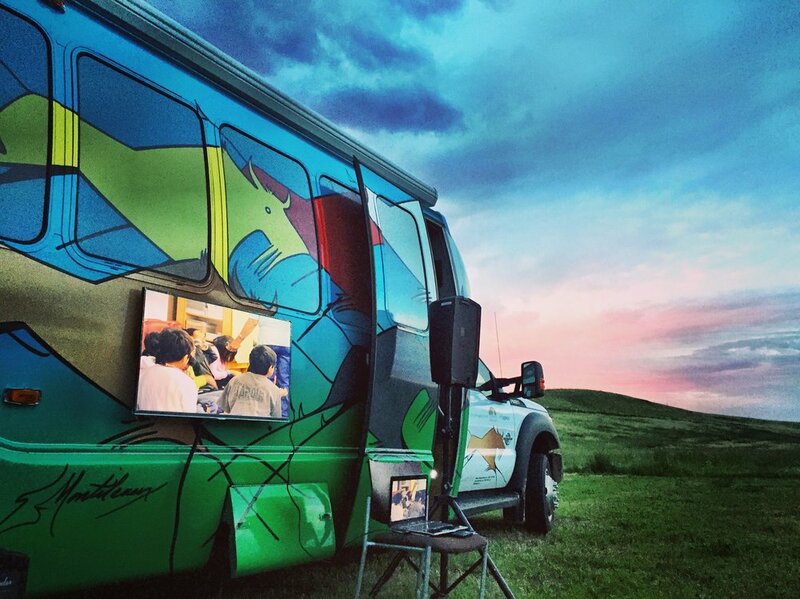 First Peoples Fund’s Rolling Rez Arts Bus was featured by PBS News Hour, the National Endowment for the Arts and the New York Times for work innovating a mobile arts unit on Pine Ridge Reservation.